It’s my favourite time of the year, mushrooms, fruits and berries are plentiful around our countryside and for the happy forager it’s most definitely a bountiful harvest this year. When it comes to mushroom foraging you really do need to know what you are doing as it can be a dangerous game of fungi roulette if you don’t. This is why I really love the ink cap mushroom as it’s so distinct in its appearance. The only thing you need to be careful with when eating ink caps is not to consume alcohol with them as sometimes they can have quite an extreme and vomity effect. I’ve gotten away with adding sherry to mine on a few occasions but I certainly wouldn’t recommend it just to be on the safe side. I’ve also got hugely into roasting kale recently and sprinkling it with homemade dukkah and basically just munching away on it or its also really kickass when combined with green tomatoes and a duck egg. Whizz up all your pesto ingredients in a food processor, loosen with oil until you are happy with the consistency and seasoning. Set aside (This will keep happily in the fridge beneath a layer of oil for at least a week). Put your aubergines and mushrooms on a roasting tray, scatter with the cilli and roast in a hot oven until cooked them remove and set aside. Make sure the kale is bone dry then roast in the oven for a few minutes until the edges are crispy but there is still a bit of softness in the centre. Blitz the pangrattato ingredients together until it is like breadcrumbs then heat some oil in a frying pan and fry until crunchy. 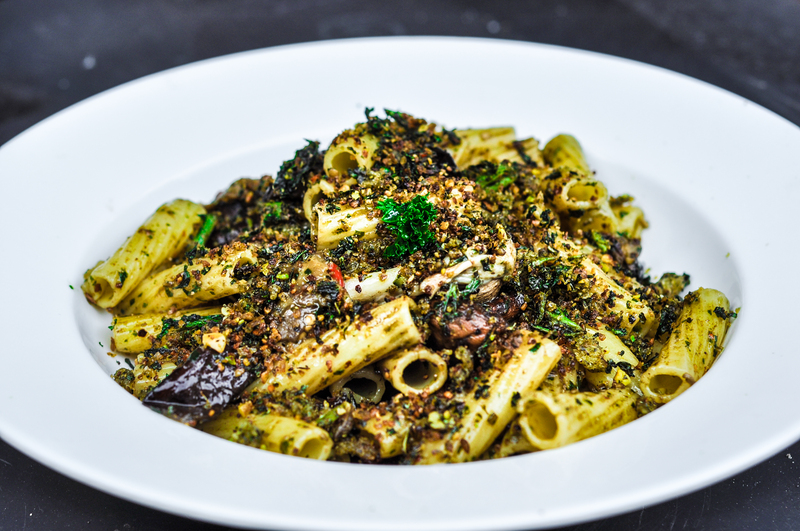 To assemble simply stir the aubergine, mushroom and pest into the drained rigatoni and to with some of the pangrattato. Cook your rigatoni in salted boiling water until al dente.